I'm just going to keep saying it - the weather in Colorado is just really weird. I'm not just talking about temperature differences between where you live, and if you drive 30 minutes someplace else, I'm talking about the temperature suddenly changing drastically in the location you're currently at. Wednesday afternoon was like that. It was a pretty nice afternoon - sunny, chilly, but not too bad (nice enough to have the windows open to get some fresh air). Within an hour of that time period, the temperature dropped 20 degrees, it clouded up outside, and by 4pm, it started snowing heavily. Although I hate driving in the snow, I love watching it snow, and love seeing everything get all white. I did take the opportunity to grab my camera and run outside to get some snow photos. Note to self - remember to bring gloves outside, since I didn't last too long because my hands were cold. This is a shot from down the street. 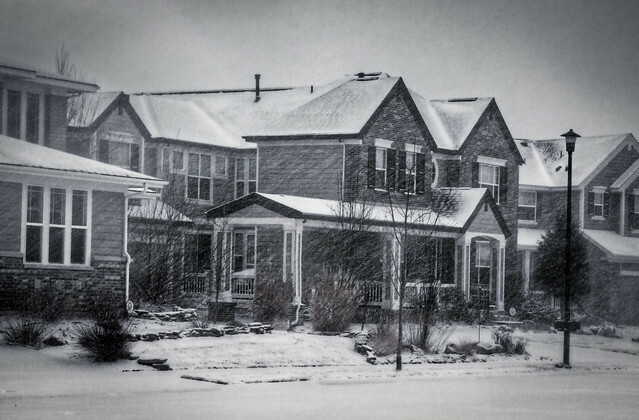 It's really hard to get good exposure shots in heavy snow, when everything is gray, so I thought the black and white conversion (with a hint of a vignette) looked nice on this one.